This Black History Month we are highlighting the movers and shakers in the fight against breast cancer within the African American community. Dr. Olufunmilayo “Funmi” Olopade is a widely respected leader in breast cancer research and served as a Komen Scholar for more than six years. 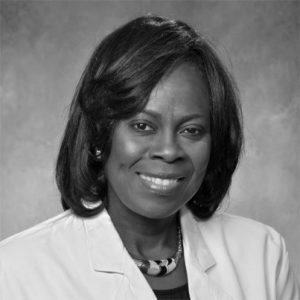 Olufunmilayo “Funmi” Olopade, M.D., F.A.C.P., is the Walter L. Palmer Distinguished Service Professor of Medicine and Human Genetics, Associate Dean, Global Health, and Director, Center for Clinical Cancer Genetics at the University of Chicago Medicine. Dr. Olopade is an expert in cancer risk assessment and individualized treatment for the most aggressive forms of breast cancer. Her research has developed novel management strategies based on an understanding of the altered genes in individual patients. She stresses comprehensive risk-reducing strategies and prevention in high-risk populations, earlier detection through advanced imaging technologies, as well as quality of life concerns for breast cancer patients. Dr. Olopade’s work has helped scientists around the globe gain a greater understanding of breast cancer. She currently serves as Director of the Center for Clinical Cancer Genetics and Professor of Medicine and Human Genetics at the University of Chicago. In 2011, Dr. Olopade received the Komen-funded AACR Distinguished Lecture on the Science of Cancer Health Disparities.